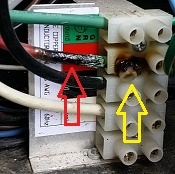 A loose connection at this terminal block got hot enough to melt the insulation off the wire. Your hot tub vibrates...a lot. If your tub is on the roof, a second floor balcony or just outside a bedroom window you already know you can hear when a jet pump is running a purge cycle in the middle of the night. When you're sitting in your hot tub and turn on the jets you can feel vibrations in your seat because the powerful jet pump and all that water moving through the plumbing at high velocity creates kinetic energy that spreads through the shell and frame and every other part of your hot tub. These vibrations can loosen the main electrical power connections and other electrical connections in your hot tub control box. 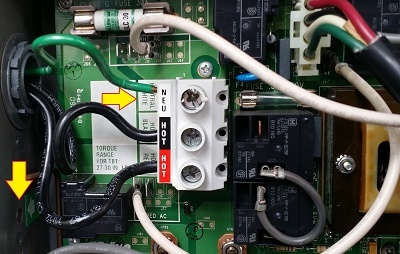 Loose electrical connections can get hot enough to melt insulation and damage expensive circuit boards. The main electrical power connections, heater power connections and jet pump power connections in your hot tub should be inspected and tightened at least once every year to prevent expensive repairs and electrical fire. Electrical fire inside the insulated cabinet of a portable hot tub can smolder for days then suddenly burst into flames. The fire burns very hot and once all that plastic starts melting and it gives off thick clouds of highly toxic smoke. If your hot tub is near the house a small electrical fire inside the cabinet can quickly spread and create a much bigger problem. 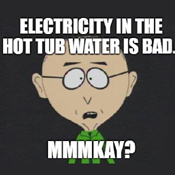 Click the button below to schedule an Quarterly Hot Tub Service and help preven hot tub electrical fires! Don't let your hot tub start the next California wildfire! Schedule a Quarterly Hot Tub Service. 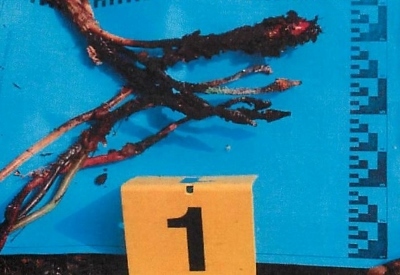 In September of 2015 a loose wire nut on the power line supplying a portable hot tub was the cause of the "2015 Valley Fire" in Lake County, CA. The Valley Fire eventually burned over 76,000 acres, destroyed over 2,000 structures and killed four people. 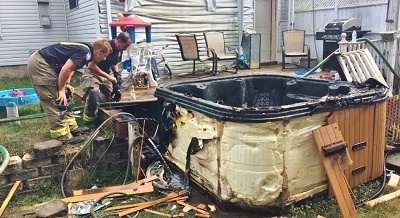 Two years later, in December of 2017, Lake County prosecutors announced they would not file criminal charges against the hot tub owners but they will likely spend the next decade in court facing civil liability for loss of life and property. Don't let your hot tub start the next California wildfire! Inspect and tighten hot tub electrical connections at least once a year. CalFire investigators determined the 2015 Valley Fire was started by a loose wire nut on power supply wires connected to a hot tub that was installed by unlicensed homeowners without a required electrical permit. "PG&E has released new details about the start of one of California's most devastating wildfires -- the October 2017 Tubbs Fire -- in a court filing that appears to shift blame onto a handyman the company says performed unlicensed electrical work on a rural property near Calistoga." If your hot tub was installed by an unlicensed contractor without an electrical permit or inspection it can still be safe. Click the button below to schedule an Quarterly Hot Tub Service for a complete electrical safety inspection and a detailed report that includes citations to relevant electric codes. The same vibrations that can loosen electrical power connections in your hot tub can also loosen ground connections. With all the wiring in a modern hot tub, the ground wire is easily the most important. The ground wire ensures the water you're soaking in has "0 Voltage Potential". That's just a technical way of saying: "no electricity in the water". It's the ground connection that keeps you safe when you're sitting inside a 220V appliance soaking in water up to your neck. The hazardous hot tub above is not grounded. The green wire, which is normally ground, has been repurposed as neutral which is normally white. Since there is no other wire connected where the ground wire should be connected...this hot tub is not grounded. If your hot tub is not grounded, you could be sitting in a pool of electicity and not even realize it unless you touch something that is grounded while you're soaking. When you're soaking up to your neck in an electrified pool of water and touch something grounded your body completes the circuit and you get shocked. If you get shocked by the water while sitting in a hot tub...odds are pretty good you won't make it out of the water and they'll find you floating face-down and permanently "relaxed". Schedule a Quarterly Hot Tub Service to tighten and test hot tub ground connections to keep you safe while soaking. A ground fault happens when some component in your hot tub malfunctions and shorts voltage to the ground wire. The water in your hot tub is deliberatley "grounded" so voltage on the ground wire means electricity in your hot tub water. Since 1994, California Electric Code requires your hot tub to be wired to a working, Class A, Ground-Fault Circuit Interrupter (GFCI). If an electrical component in your hot tub "short circuits" to ground creating a ground-fault, the GFCI will immediately trip protecting anyone who might be sitting in the water when the short circuit occurs. 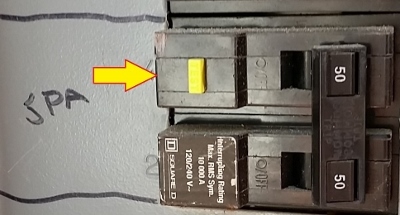 Your GFCI breaker trips immediately when it detects a "ground fault" which keeps you safe while you're soaking. Click the button below to schedule a Quarterly Hot Tub Service to test and verifiy GFCI protection.